Helpful kids are happy kids: Pitching in with household jobs builds confidence and gives children a sense of belonging, psychologists say. Sisters Angela, 12, Gelmy, 9, and Alexa Natali, 4, know this well. Since they were toddlers, their mom has encouraged them to help around their home in a village near Valladolid, Mexico. In many Mexican communities, children have the chance to contribute to their families by helping take care of toddlers and babies. Here, Ruby holds her cousin Daphne in her grandmother's home. 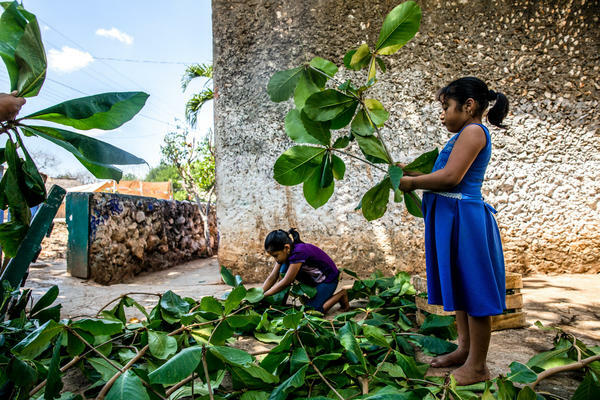 In many Maya communities, children see themselves as partners with their parents when it comes to working around the house, says psychologist Suzanne Gaskins. 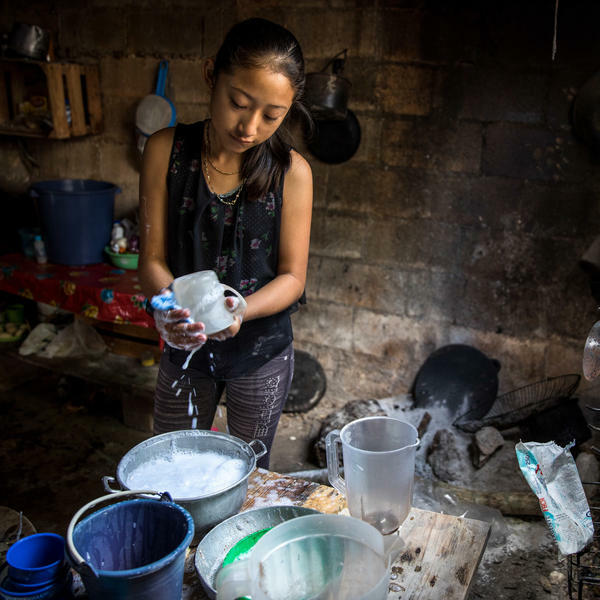 Susy, 12, says she voluntarily washes the dishes sometimes because she wants to help her mom. Even small tasks, like raking leaves, can give kids a sense of pride and accomplishment, psychologists say. The key is to be sure the tasks make a real contribution to the household and aren't just "mock work." If you give young children a chance to help around the house, psychologists say, you might be surprised by what they can learn. 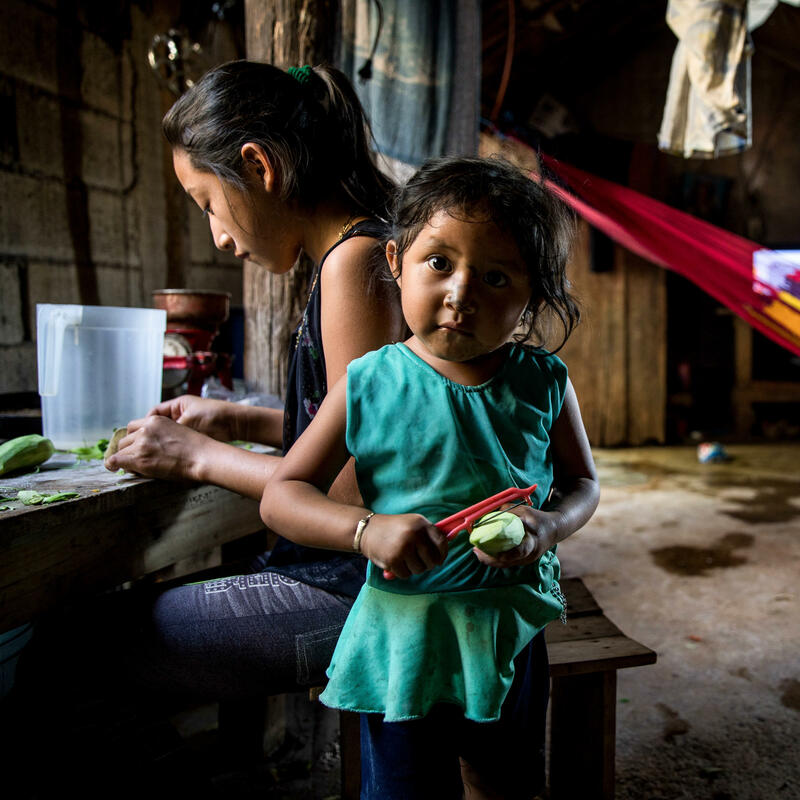 At home in a small village near Valladolid, Mexico, Alondra, 3, peels a mango. Her sister Susy is by her side. Ruby helps to clean the backyard of her grandmother's home in a small Maya village in Yucatán, Mexico. Gaskins was so impressed by the girls' enthusiasm for helping around the house that she started to study how kids in the village spend their time. She quickly realized that the young kids not only made big contributions to household chores, but also that they often did so without being told. In fact, many times, helping out was their idea. "Many times the children asked to do work around the house," Gaskins says. 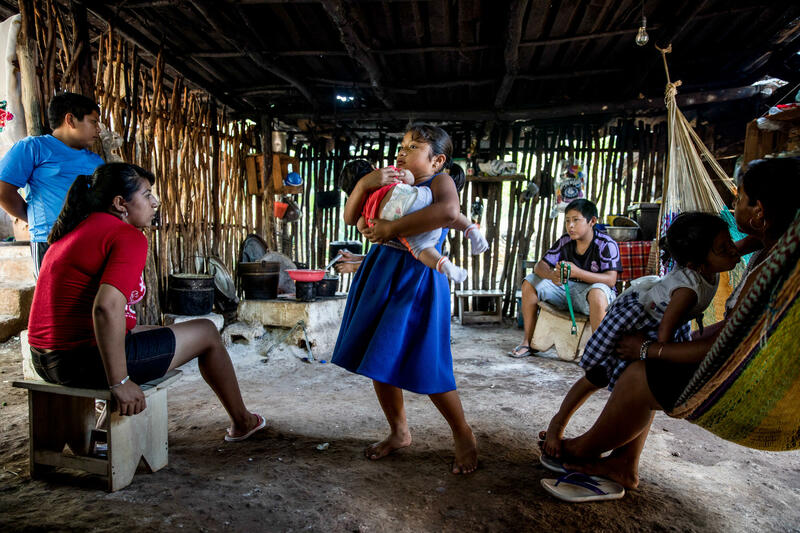 "Mom, I'm going to help you do everything"
In the past 30 years, Gaskins and a handful of other psychologists have been documenting a remarkable phenomenon in indigenous families in Mexico and Guatemala: Young children in these homes are extremely helpful around the house. In one study, psychologist Barbara Rogoff and her colleague Lucia Alcala, at Cal State, Fullerton, interviewed moms in Guadalajara, Mexico, who had indigenous ancestry. The researchers asked the moms what their children, who were all between the ages of 6 and 8, do to help around the house and how often they do these tasks voluntarily. "It's a really complex term," says Andrew Coppens, an education researcher at the University of New Hampshire, who collaborates with Rogoff. "It's not just doing what you're told, and it's not just helping out. It's knowing the kind of help that is situationally appropriate because you're paying attention." And the phenomenon isn't limited to children in Mexico. When families with indigenous roots move to the U.S., the parents keep the same approach to chores. A few years ago, Coppens and his colleagues interviewed Mexican-American moms in Watsonville, Calif., about how often their children do chores. They then compared these moms' responses with those from middle-class families in Silicon Valley with European ancestry. Although there was a lot a variation within each culture, Coppens says, a clear pattern emerged: "The Mexican-American kids, aged 6 to 7, were doing about twice as much around the house as the middle-class European-American kids, on average," he says. "And they were doing so, much, much more voluntarily." So what on earth is these parents' secret? This may come as a surprise, but over and over again, researchers said one thing is key: embracing the power of toddlers. Yes, I'm talking about 1- to 3-year-olds who, in our culture, are more often associated with the term "terrible" than "helpful." If you look around the world — whether the parents are hunting and gathering in Ecuador, raising cattle in the Himalayas or developing software in Silicon Valley — their toddlers have a few things in common. The first is tantrums. Yes, toddler tantrums are pretty much unavoidable, no matter where you live, the ethnographic record shows. But the second commonality is more positive: "Toddlers are very eager to be helpful," says David Lancy, an anthropologist at Utah State University, who documented this universality in his new book, Anthropology Perspectives on Children as Helpers, Workers, Artisans, and Laborers. Toddlers are born assistants. Need help sweeping up the kitchen? Rinsing a dish? Or cracking an egg? No worries. Toddlers Inc. will be there on the double. In one study, 20-month-olds actually stopped playing with a new toy and walked across the room to help an adult pick up something from the floor. And they didn't need a reward for their assistance. In fact, the toddlers were less likely to help a second time if they were given a toy afterward, the study found. "Children appear to have an intrinsic motivation to help," psychologists Felix Warneken and Michael Tomasello concluded. "And extrinsic rewards seem to undermine it." No one understands exactly why toddlers have this innate desire to be helpful (or why rewards diminish it). But it could stem from their strong drive to be around their family, says Rebeca Mejia-Arauz, a psychologist at ITESO University in Guadalajara. "I think this point is really key," she says. "Doing things with other people makes them happy and is important for their emotional development. They see what their mom or siblings are doing, and they want to do it." Messy toddler today, helpful kid later? Sure, toddlers may want to help, but let's face reality here. At first, they really can't do much. They can be clumsy, destructive and even enraging. Their involvement in chores often slows things down or makes a mess. For this reason, many parents in Western culture rebuff a toddler's offer to help, Mejia-Arauz says. "We have mothers tell us things like, 'I need to do a chore very quickly, and if my toddler tries to help, he makes a mess. So I'd rather do it myself than having them helping,' " she says. In many instances, Western moms tell the toddlers to go and play while they do the chores, she says. But moms with indigenous heritage often do the exact opposite. First, they give toddlers the opportunity to watch the chores as often as possible. "They invite them over by saying something like, 'Come, my child, and help me while I wash the dishes,' " Mejia-Arauz says. Then if the child wants to participate, "they are welcome," she says, even if it means going more slowly or if the mom has to redo the task. The moms see it as an investment, Mejia-Arauz says: Encourage the messy, incompetent toddler who really wants to do the dishes now, and over time, he'll turn into the competent 7-year-old who still wants to help. Research supports this hypothesis, says the University of New Hampshire's Andrew Coppens. "Early opportunities to collaborate with parents likely sets off a developmental trajectory that leads to children voluntarily helping and pitching in at home," he says. Or another way to look at it is: If you tell a child enough times, "No, you're not involved in this chore," eventually they will believe you. What about middle-class, American kids? Cultures are complex packages. Parenting models in one culture likely won't work well in another. It's a bit like fusion cuisine. You can't simply take a few ingredients from a Oaxacan beef stew, add them to a New England chowder and expect it to taste good. That said, American parents can extract useful ideas from Mexican parenting style when it comes to raising helpful kids, says Utah State University's David Lancy. "Absolutely," he says. "In fact, I think we are doing a disservice to toddlers and older children when we deny them the opportunity to pitch in and be helpful. "But replicating the approach isn't easy in our society. It's not a slam-dunk," he adds. "We have to slow down what we're doing. We have to make allowances." Let them watch you cook, do the laundry or walk the dog. Let them help change a light bulb, plant herbs in the garden or help make a bed. Basically, anything you want them to help with later on in life, be sure they're around while the activity is occurring. "Especially during the early years, give children the opportunity to wander over and watch what's going on with the adults," Coppens says. You'll be surprised by how much toddlers and young children learn by simply observing what you do — no lecturing or explaining necessary. This exposure also helps young children to see that chores are a social activity, Coppens says. They're opportunities to work together and be with family members — which young kids crave. Then kids associate chores with a fun, positive activity. "This psychological integration into the family seems to be really powerful developmentally for kids learning to work together," Coppens says. Offer opportunities for the child to help with the chore you're doing. Give them a task that is appropriate with their skill level. Maybe it's holding a measuring a cup while baking, moving a chair while sweeping or drying off a dish or two. The task can be tiny, but the key part, Coppens says, is that it has to make a real contribution to the chore. It can't be a "fake" project or an action that has nothing to do with the real chore. Then everyone isn't working together for a common goal. "In one of our studies, the middle-class, European families reported giving toddlers what we called 'mock work,' " Coppens says. For example, a mom would sweep the kitchen and afterward, she would give the broom to her young child to "resweep" the kitchen. "The parents knew that the child wasn't contributing to chore, and pretty quickly, the kid will pick up on the same idea," Coppens says. And the kid loses out on the pride and sense of accomplishment that comes from making a real contribution. A big motivating force for young children is being around their family, working on a common goal. This motivation is lost if we divide up chores so everyone is working solo (or give kids mock work). So for example, if you're doing laundry, be sure everyone is folding everyone's clothes. If you have the children just fold their own clothes while you fold your own, the tasks becomes more about working independently. "Sometimes people think that to get children to do chores, like Maya kids do, the parents must be doing a really good job of controlling the kids," says Barbara Rogoff of UC Santa Cruz. But actually, the opposite is true. "The aim is not to control the kids, but rather to develop the child's own initiative," she adds. To do that, indigenous parents don't force kids to help. They encourage the child and offer opportunities to participate when the child is interested. Forcing the child actually has the opposite effect, Rogoff says. It can generate resistance. "Just like adults, kids don't like being bossed around," she says. "Asking a little kid, 'Could you help me with this?' often gets them on board more often than simply, saying 'You must do this.' "
When in doubt, talk collaboratively: "Saying to a child: 'let's do this together' sounds so much more interesting and rewarding than saying, 'I want you to do this,' " she adds. In the U.S., we often think toddlers and young children simply want to play, Coppens says. But the indigenous moms see a toddler coming over to them as an indication that they want to help. The shift in mindset changes how the parent responds to the toddler's request to participate in chore, Coppens says. "All parents are interested in supporting their kids," he says. "So if you assume that your child wants to play, then you are likely to find a better way for them to play that's somewhere out of your way while you finish the chore." The result is a child separated from the adult activity and not around to learn about the chore — or about how to work together collaboratively. "But if you make the assumption the toddler wants to help you, but he just doesn't have a good understanding of how to do that — then you'll try to find a way for him to help," Coppens adds. "You will help him help." Over time, the "help" will grow in complexity. And the 2-year-old who stirs the pancake mix today could turn into the 6-year-old who makes the whole family breakfast — and feels darn good about it. Getting a child to do chores around the house without being told may seem an impossible dream for parents. But researchers have found several cultures around the world where children do chores around the house without being told. Imagine. As part of an NPR-wide series called (laughter) How To Raise A Human, NPR's Michaeleen Doucleff reports on how we can learn from this. MICHAELEEN DOUCLEFF, BYLINE: Back in 2005, Andrew Coppens was teaching elementary school in a rural area of Nicaragua. Families there ran a dairy farm. And before school one morning, Coppens visited the dairy and was shocked at what he saw. ANDREW COPPENS: There were just tons of kids there. DOUCLEFF: Were kids actually milking the cows? COPPENS: Yeah, in some cases. And they were incredibly skillful at it. DOUCLEFF: Quickly, Coppens realized that this happened every morning. The dairy was packed with kids - 9, 10, 11-year-olds - before school. COPPENS: Every morning, they were waking up much earlier than I did and, you know, running to the farms to help out. DOUCLEFF: But what really blew his mind was all this help was voluntary. COPPENS: Nobody asked them to be there, and they weren't paid to be there. They could come and go as they pleased. Everybody had smiles on their face but not in a romanticized way. I mean, it was - if it was hot, kids were complaining, you know, but adults were complaining, too. DOUCLEFF: Coppens decided to figure out what was going on. How did the families raise such helpful kids? He came back to the states and started a Ph.D. and teamed up with Barbara Rogoff, a psychologist at UC Santa Cruz who had been studying a similar phenomenon with Mexican kids. The kids weren't waking up early to milk cows, but instead, they volunteered to help around the house - help cook, do laundry, clean up. BARBARA ROGOFF: So an example is Mom comes home from work, and she's really tired, and she just plops herself down on the couch. And the daughter, who I think is 8, says, Mom, you're really tired, but we need to clean up the house. How about I turn on the radio and I'll take care of the kitchen and you take care of the living room, and we'll have it all cleaned up? DOUCLEFF: It sounds like this amazing dream for a lot of parents (laughter). ROGOFF: Yeah, but it's something that the mothers really value, not for the work alone but for the children's development. DOUCLEFF: Rogoff and Coppens have also found that when some of these families move to the U.S., they bring these values with them. Coppens started interviewing Mexican-American moms in Watsonville, Calif., and then compared their answers to those from white, middle-class families in Silicon Valley. A clear pattern emerged. 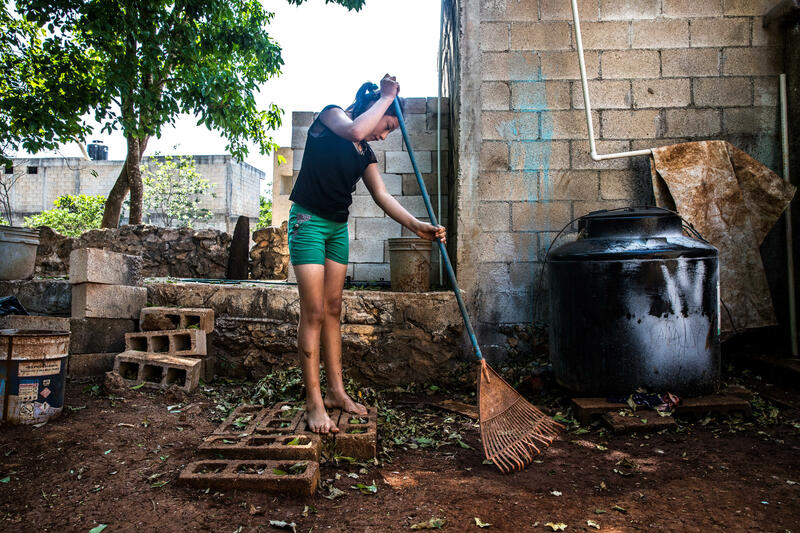 COPPENS: The Mexican-American kids at age 6 to 7 were doing about twice as much around the house as the middle-class European-American kids were doing, and they were doing so much, much more voluntarily. DOUCLEFF: So what on Earth is their secret? How do they get 6, 7, 8-year-olds to be so helpful voluntarily? No gold stars, no promise of an allowance. OK. This is going to shock you, but the researchers say one thing is key. DOUCLEFF: Toddlers - embracing the power of the 1-to-3-year-old set. If you look around the world, toddlers everywhere have two things in common - No 1. DOUCLEFF: Yep, tantrums. Toddler tantrums are pretty much universal. That right there is my daughter, Rosemary. She's 2 1/2 and letting us know she isn't happy with oatmeal for breakfast. What do you want to make for breakfast? DOUCLEFF: But there's something else universal. I'll let Rosy explain. OK, Rosemary, do you like to help around the house with chores? DOUCLEFF: What do you like to help with? DOUCLEFF: Yeah. What else? Is there anything else you like to help? All around the world, toddlers want to be helpful. They want to do chores. REBECCA MEJIA-ARAUZ: They see - they look at what other people are doing, and they want to do it. DOUCLEFF: That's Rebecca Mejia-Arauz. She's a collaborator on the research and a child psychologist at ITESO University in Guadalajara. She says this desire to help comes from toddlers' strong drive to be around their family, especially their moms. MEJIA-ARAUZ: They enjoy being with other people. MEJIA-ARAUZ: I need to do this very quickly, and if they help, this is a mess, so I'd rather do it myself than having them helping. MEJIA-ARAUZ: Come, my child. Help me while I'll wash the dishes. DOUCLEFF: Even if it means at the beginning things going more slowly or you having to redo it. MEJIA-ARAUZ: Exactly, yeah. We have interviews with mothers in which they say, well, for example, doing the dishes, at the beginning, the water was all over the place and so and so. But I would allow him to do this so they learn. DOUCLEFF: So the mom sees it as an investment. Encourage the messy, incompetent toddler who really wants to sweep or do the dishes, and over time, he or she will turn into the competent 7, 8-year-old who still wants to help. And Mejia-Arauz says if you give young kids a chance to help, you might be surprised at how fast they learn. One mom said her son could fry pork at age 2, and by age 9, he could butcher the whole pig. Now, culture is complex. David Lancy, an anthropologist at Utah State University, says taking a parenting strategy from one culture and plopping it into another doesn't always work. But he says he does think people can learn a lot from the Mexican moms. DAVID LANCY: Absolutely. Granted, it's difficult in our package, in our society. It's not a slam dunk. DOUCLEFF: He says American parents have oodles of opportunities to get toddlers and young children involved with family activities. LANCY: Cooking in the kitchen or gardening or construction, building a dog house - all those activities children will automatically volunteer to participate in. DOUCLEFF: But parents have to rethink how they do these things. LANCY: We have to make allowances. We have to slow down what we're doing. We have to make sure that there are appropriately child-sized tools available. It just doesn't happen automatically. DOUCLEFF: And he says parents have to change their mindset about kids' intentions. Instead of assuming toddlers or young kids want to play or make a mess, assume they're there to help the family. They just need a little bit of help figuring out how to do that. Michaelaeen Doucleff, NPR News. Transcript provided by NPR, Copyright NPR.